Author Ardath Albee supplies the necessary tools for looking beyond the outdated campaign approach of one-off, unrelated buyer interactions. She outlines clear-cut strategies for developing customer-obsessed communications, identifying the distinct value that differentiates your company, and making the shift from one-off communications to a continuum approach. You’ll also gain insights to ensure that data and metrics are used to relate programs to the achievement of business objectives. Through engaging case studies, Albee shows marketers how to create brand stories that build over time in order to ensure continued relevance, engagement, and progression toward buying. Adapting to a continuum approach takes a shift in mindset and reinforcement to ensure it becomes a natural part of approaching marketing strategy. 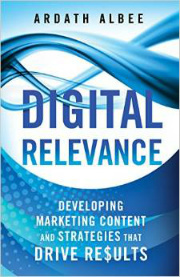 Digital Relevance provides practical solutions for organically integrating this important method into your content strategy. The ‘Relevance Maturity Matrix’ will help you understand the levels of transition and what it takes to move from one level to the next–as well as why it’s not prudent to rest on past achievements. The reality of continuous change means that even if you reach mastery today, you’ll have to stay on your toes to keep it. That’s exactly what Digital Relevance prepares you to do.